In Nazi Germany the use of propaganda was taken to newer and more perverse levels than the world has ever seen, but 2014 just might have a spin-machine that can trump it. Welcome to the Monsanto-GMO lie apparatus. It works when you feed it millions, and appoint imbeciles to public office (check out this infographic), and breaks down with the activism of countless citizens. Recently, Monsanto’s CEO admitted that the industry needs to do more to sway the public and convince everyone that GMOs are the one and only answer. Proposals to have GMO foods labeled are gaining traction in many states. While a labeling bill in St. Louis was recently discussed at Monsanto’s annual share holder meeting, it was openly admitted that more propaganda was needed to defeat the growing surge of pro-GMO legislation. Monsanto Co. wants you to know just how good their poison crops are for you – and you really don’t need to know what’s in your food, do you? Just shut up and eat it already. Of course, investors in Monsanto stock certainly don’t want labeling either – that means their ill-gotten millions would dwindle to the value of a genetically modified corn stalk. They made this abundantly clear in the meeting. Only individuals representing about 4% of shares were in favor of GMO labeling. 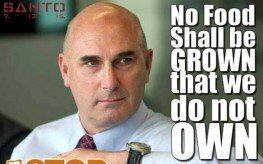 Monsanto Chief Executive Hugh Grant did show up at the meeting, though, and added his own admission that the company has some fierce critics – something he has never given credence to before. Need to do more in what way? You mean, like spend millions more to illegally fund the anti-labeling campaigns, Mr. Grant? Anti-GMO protestors rallied just outside the building during the meeting, and they are equally prepared to take real information to the people to combat the lies that without GMO food the world will starve, or that food prices will sky-rocket. What baloney. We don’t need to eat anything – GMO or not – when we’re dead from pesticides and herbicide exposure. Ever thought of that small detail? Go figure a site called Naturalsociety would be against it, go to sell your high priced natural products right? of course GMO’s should be illegal…..They were a failed “experiment” and proven to be very toxic and a detriment to the eco system…of course the powers that be will do their utmost to push them so that the shareholders can line their shortsighted pockets with gold….Forget their own grand children let alone ours! I think labeling is a HUGE mistake in Monsanto’s favor! GMOs and glyphosate are poison to everything they are applied to, put in, touch (bees), ingested by. Why label them? We need to ban them totally!!! Monsanto is small change compared to the big food industry, and the food industry will only produce what WE buy, So it is up to us to make their choices for them; hopefully by buying Organic. Not buying process foods is a good way to start.